It took me three hours to climb up to Tashigang school and hermitage. 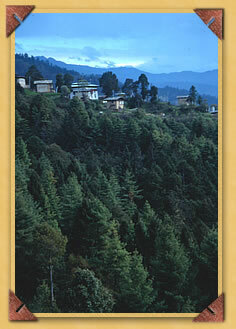 Exquisite to behold, Tashigang sits atop a mountain of magical forests and rivers at the foot of the Himalayas. Yet I found life was incredibly austere at Tashigang. Treated like a guest I was given one of the nicest rooms. It was tiny, unplumbed and unheated. Torn plastic was heroically clinging to keep out the freezing howling wind that blew over me as I shivered myself to sleep on the wooden floor under a thin blanket. I was really moved by the dedication of these young students, and by Lopen Kado himself who has never once asked for anything. Tashigang gompa school, a critical part of Bhutan's future. Young Bhutanese monks chatting between study sessions. 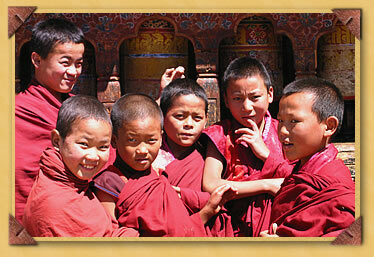 Young monks in Bhutan desperately need support and encouragement. They are the backbone of an authentic culture based on wisdom and loving kindness. These days it is tempting for them to choose a less noble path than the traditional practice of their legacy. Television, movies, and video stores have sprung up in several districts of Bhutan. The difficulties of a spiritual life are harder to endure with consumerism knocking at the door. Removing just some of their hardships will make all the difference in keeping Bhutan's spiritual and cultural flame burning.